As I sat down and began writing this post, I realized there was so much to say about this meal, this restaurant, that it deserved to be broken into three parts (first, second, and third courses). Well, that, and it was turning into such a novel that no one on this earth would have the attention span required to make it all the way through. le Fou Frog. 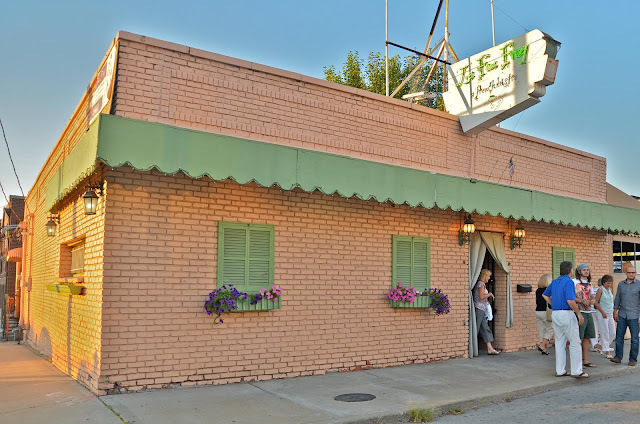 Hands down, my absolute FAVORITE restaurant in all of KC. Favorite, favorite, FAVORITE. Yes, it's true, this is it. Completely unassuming from the outside, the proof is in the food. And the ambiance. Inside, the décor is eclectic shabby chic and every single person that works there is passionate about what they do. 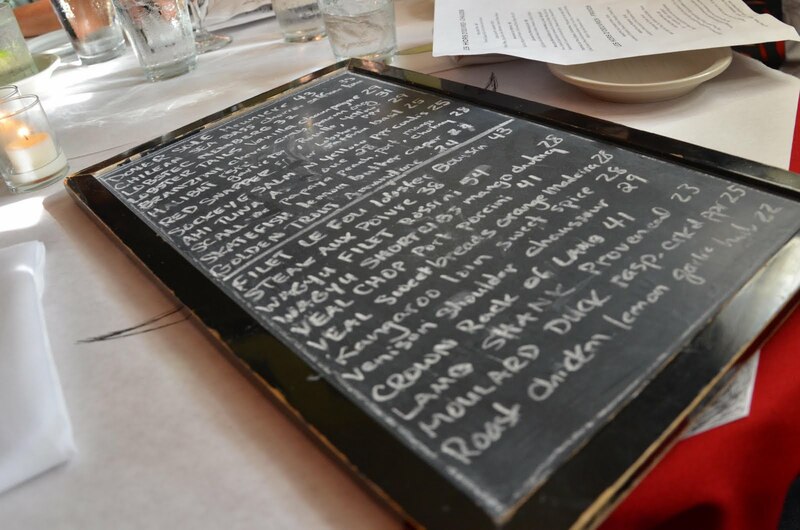 The menu here is written on chalkboards; one per table. Top half is from the sea, bottom half, land. The menu has a few staples, their tried and true specialties, with some varying seasonal dishes sprinkled in. 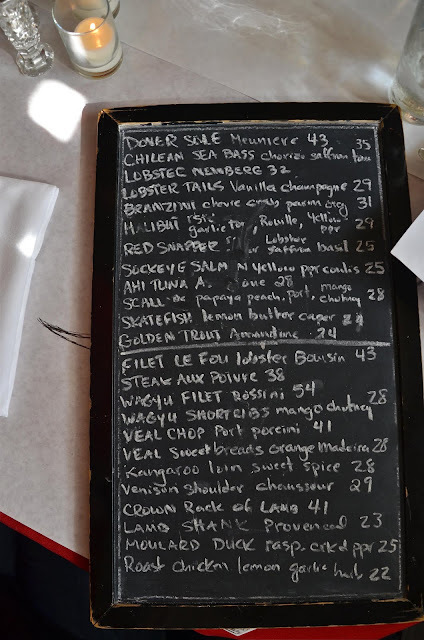 As you can see, their entrée prices range from $22 (roast chicken) to $54 (Waygu beef filet). The staple menu items? - Lobster Tails with vanilla champagne sauce. A must-have. Lobster and vanilla beans pair beautifully. - Filet le Fou. You'll see this below. It's their number one dish. Which means, to me, it's the number one dish in all of KC. It's a melt-in-your-mouth filet of beef tenderloin that is accompanied by lobster boursin. Heaven and pure bliss come together on a plate. - Crown Rack of Lamb. The lamb is served with a Moroccan couscous. It's a close second behind the filet, and could easily feed two. It would be a great entrée to share, enabling you to enjoy an appetizer and dessert as well without blowing out your stomach and your wallet. - Steak au Poivre. Something I've never tried, I've seen this plate come out many times to tables nearby. It's a traditional French steak frites dish served with some greens alongside. It is definitely a generous portion. There's a few other dishes that are menu regulars (I think), but I haven't had them and I think their preparation differs. Scallops is one of these, which is what I ordered this particular time. We got to try a ton of new things during this last trip because it was a big family dinner. And when it's just The Stallion and I, well, it's insanely difficult to stray from our favorites. Case in point: Tartare de Thon (tuna tartare). Ah, bien sûr, this dish is amazing. We get it EVERY. TIME. The sushi-grade tuna is roughly chopped and then shaped into a tall cylinder, placed onto a bed of julienned seaweeed and topped with fish eggs. Accompanying this on the plate are house-made waffle potato chips, sliced cucumber, white and black sesame seeds, and soy and wasabi sauces. 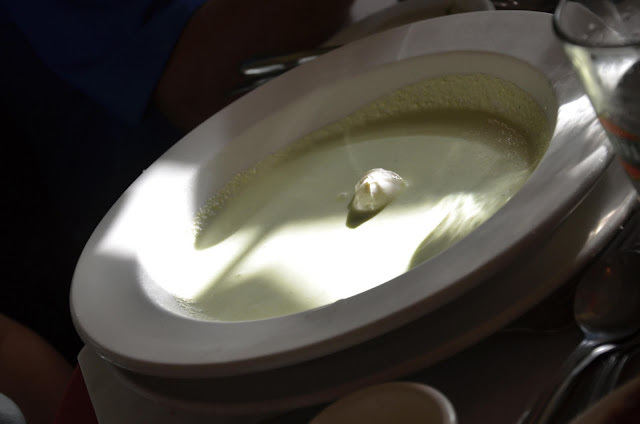 For the first time, we tried their steamed mussels, which are served in a white wine cream sauce. 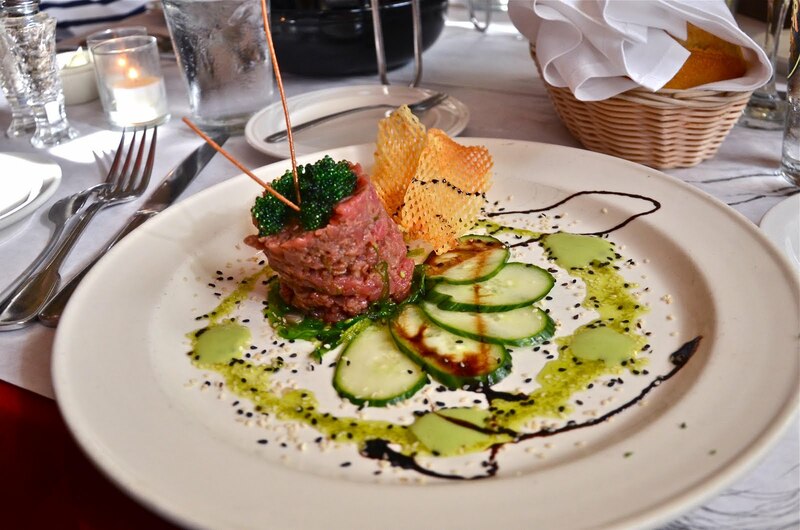 A French staple, and one of my father's favorites, we couldn't pass up ordering this dish. They were exquisite, and the leftover broth is perfect for soaking your bread. Grammy ordered the French onion soup, again something new for us. Oh mon Dieu! This was phenomenal. 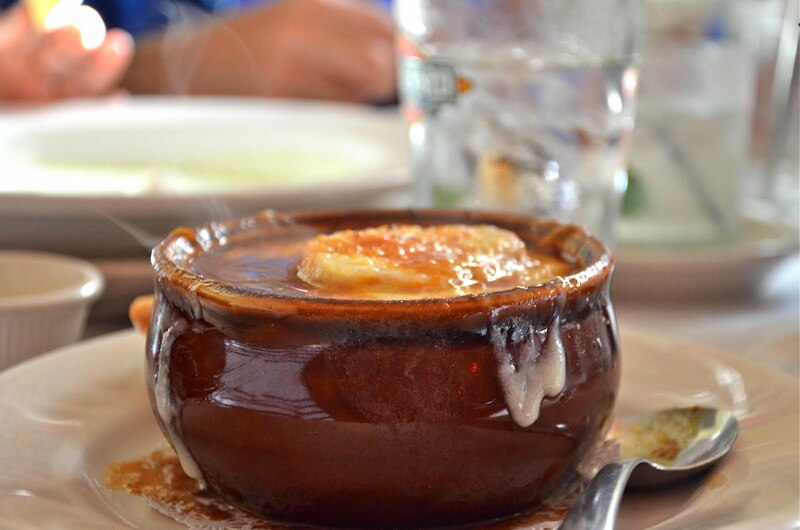 The best French onion soup you will ever have. 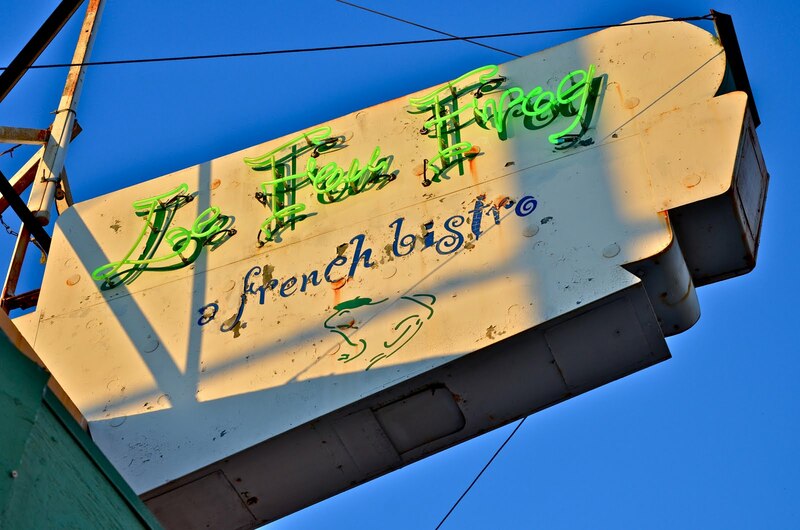 All too often this soup is extremely salty, but not surprisingly, le Fou Frog's was not at all. I'd guess that perhaps they even make their own beef stock using leftover ingredients from other dishes. It is apparent that they take their time with the onions, using low heat to ensure the flavors have much time to develop. I even think they might add a touch of tomato to balance it all out. My mother tried the cool cucumber soup. This varies a little from the Cucumber Dill Gazpacho that I posted a few weeks ago. Instead of greek yogurt, they used milk/cream. They also added a touch of vinegar and garnished with some crème fraîche. With delicate flavors, this dish is light and refreshing. Before dinner arrives, let's take a look around. This restaurant is not huge, as you can see. It's cozy and intimate. I love coming in the winter when it gets dark earlier at night because the restaurant is then very dark as well. You almost feel as though you're in some sort of hideaway; and I particularly love walking through the thick, red velvet drapes that hang just inside the front door. In the winter, they function well for keeping the cold out, but to me, regardless of season, they are the veil between reality and bliss. Passing through that boundary somehow seems to strip me of any stress or worries; it is purely me that makes it to the other side, escaping reality, if only for a few hours. Et bien sûr, jouir la délicieuse cuisine. okay i am going to have to try this!! my two favorite places in KC are R-Bar and Julian so maybe this will top my list!! we love trying local KC restaurants so I love your best of list! it was great meeting you last night! We just moved to the midwest (Dayton, Ohio). We come from out west CA/UT area. 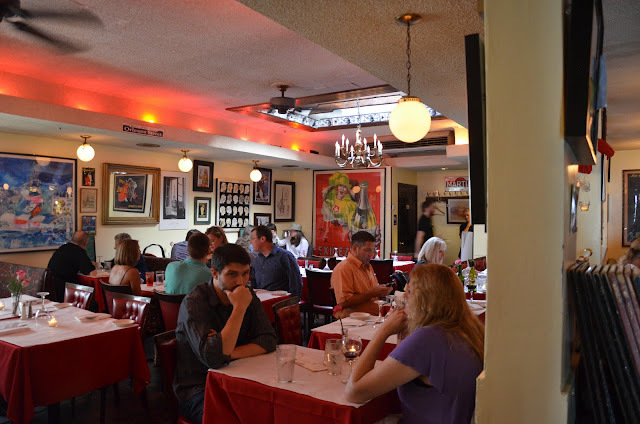 In Dayton there are lots of french restaurants. That's one cuisine I'm not familiar with. I guess I'll be trying it out soon. All the food you posted about looks amazing!!! The tartare! 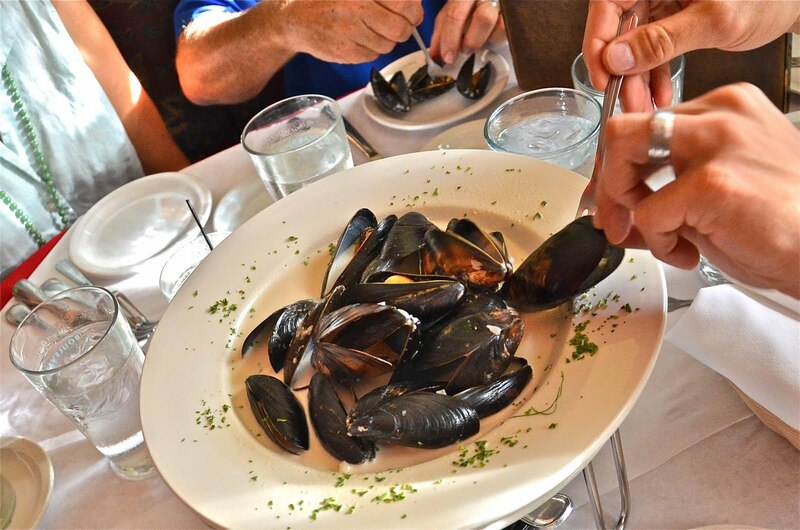 The mussels! That soup! !